IAS UPSC Nashik 2015 Examination Training CET Process is starting from the 23 November 2014. All Details about this training examination are given below. check the all important examination links given below. 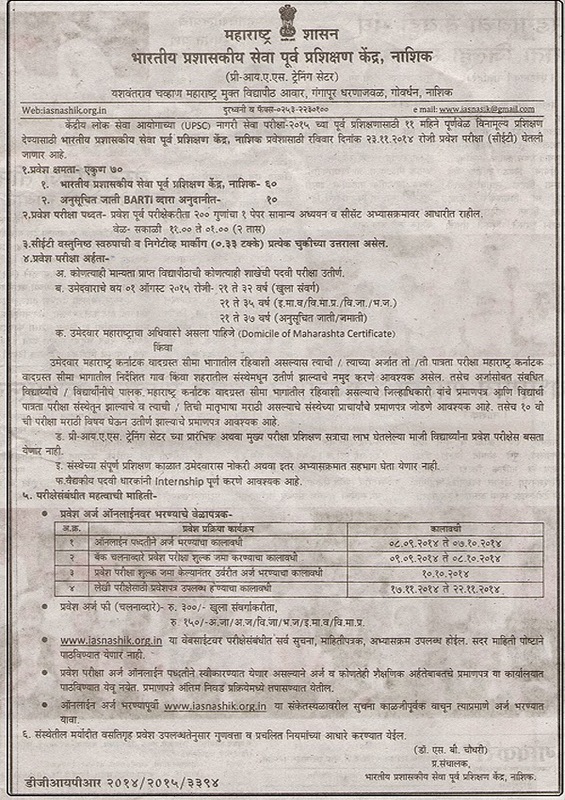 Last Date To apply for the CET Examination is the 7 October 2014. Read all important details & Apply for the CET of IAS Nashik 2015 Examination. To inspire more number of candidates from the State to enter Indian Administrative and other allied Services, in addition to the four already existing Pre-IAS Training Centres at Mumbai, Aurangabad, Kolhapur and Nagpur, Department of Higher and Technical Education, Government of Maharashtra has started two more Pre-IAS Training Centres one at Nashik and other at Amravati in the month of June, 2013.